NAIROBI, Kenya (CNS) — The international community is facing a stark and serious choice, “either to improve or to destroy the environment,” Pope Francis said, referring to the Paris Climate Conference. “It would be sad, and I dare say even catastrophic, were special interests to prevail over the common good,” the pope said Nov. 26 during a visit to the headquarters in Nairobi of the U.N. Environment Program and U.N. Habitat, an agency concerned with urban planning. Under the auspices of the United Nations, the Paris conference Nov. 30-Dec. 11 has the aim of achieving a legally binding and universal agreement on measures to stem climate change and protect the environment. Pope Francis spoke at length about the importance of the conference during his visit to the U.N. offices, and his top aides had a meeting the evening before with Kenya’s environment minister and other officials to discuss their hopes and strategies for the Paris meeting. 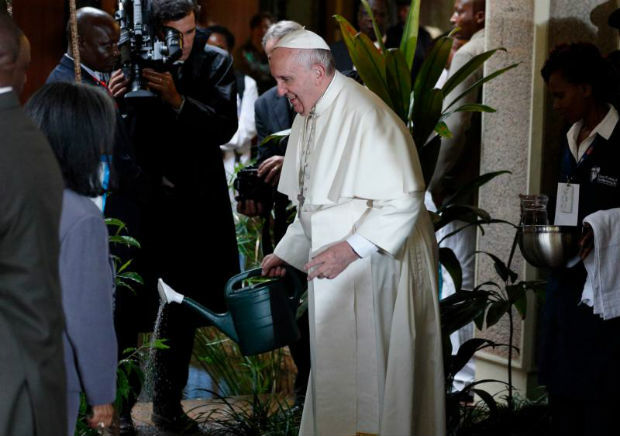 On his way into the meeting with U.N. officials and diplomats accredited to the two U.N. agencies, Pope Francis planted a tree. While his speech contained ample quotes from his June encyclical on the environment, the pope also referred several times to the significance of planting trees and borrowed several lines from a speech he made in Bolivia in July to a variety of grass-roots movements advocating for justice for the poor. 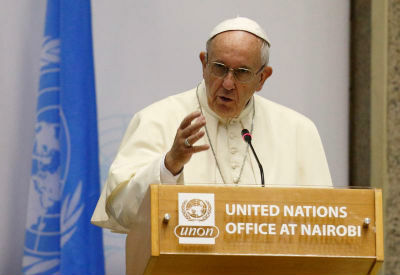 In fact, just as in the encyclical, “Laudato Si’,” the pope insisted in Nairobi that there is a close connection between environmental destruction and unjust economic and political policies that penalize the poor. “We are faced with a great political and economic obligation to rethink and correct the dysfunctions and distortions of the current model of development,” he said, especially because of their emphasis on exploiting natural resources, but not sharing the benefits with local communities. To achieve a comprehensive and fair agreement, he said, real dialogue is necessary among politicians, scientists, business leaders and representatives of civil society, including the poorest sectors of those societies. Pope Francis insisted that human beings are capable of changing course, choosing what is good and making a fresh start. The key, he said, will be to put the economy and politics at the service of people, who are called to live in harmony with the rest of creation. “Far from an idealistic utopia, this is a realistic prospect which makes the human person and human dignity the point of departure and the goal of everything,” he said. A new respect for human dignity and for the environment are part of the same attitude of giving value to all that God made, he said.